Teacher Gao runs the primary school in a tiny mountain village. He is taking a month-long leave of absence to tend to his ailing mother. In his place, the district sends Wei Minzhi… a 13-year-old girl barely more educated than the children she’ll be looking after. No one else would come. Wei has been promised 50 yuan (approximately $30) for her service, and an extra 10 yuan if none of the students leave the school. She argues with the village chief when one of the little girls is pulled out to attend a sports-oriented school for her running abilities. As if that wasn’t bad enough, the class troublemaker Zhang Huike is sent to the city to earn money to pay off his family’s debts. Wei undergoes a difficult quest to get him back. I haven’t mentioned any actors’ names because everyone in the film is using their own names, and most of them are playing some version of themselves. The stationery store owner really owns that store, the restaurant owner really owns that restaurant, the TV station employees all work at that TV station. In the entire cast, only two have any other credits listed on IMDb. Little Zhang Huike had a small part in another film the following year. Mei Bai (the restaurant owner) had the lead role in Ma xi tuan de xin jie mu… 38 years earlier. And yet the entire unprofessional cast is fantastic. Allowed to basically be themselves in their normal situations, they feel completely natural. There is no awkwardness before the camera… except the planned awkwardness of Wei’s TV appearance, which is perfectly natural in its own right. Wei has a powerful presence by the force of her unwavering obstinacy. 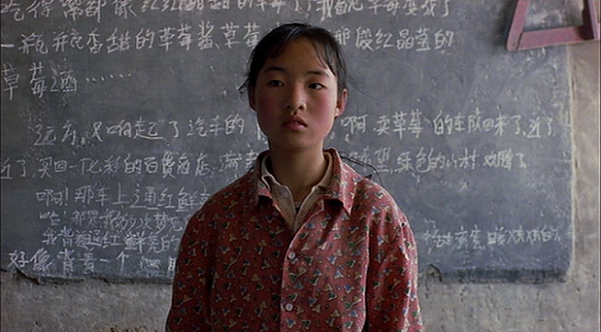 The film is the yin to The Story of Qiu Ju‘s yang. Both heroines are doggedly persistent in their pursuit of their goals, to the point where they annoy others with it. But Qiu Ju’s journey and Wei Minzhi’s journey have differing outcomes. Any sweetness to the story, however, should be taken with a grain of salt. The movie is absolutely lovely and endearing and warm and funny, but Zhang makes it clear that the situation is dire. The educational system woefully underfunds schools in the rural areas. A mere box of chalk is a precious asset not to be wasted. The residents of these small towns and villages often cannot afford to send their small children to school when they could be working instead. These people budget their lives in terms of pennies. This entry was posted on June 1, 2013 at 3:02 pm	and is filed under Movie Reviews. You can follow any responses to this entry through the RSS 2.0 feed. You can leave a response, or trackback from your own site.